Addimania by Home Cooking is an app for the iPhone, iPod Touch, and the iPad and costs $0.99. This is a game where you add up to a chosen number on a six by six grid with randomly generated numbers. You get points for doing this while being timed. Addimania has Game Center support which has rankings and achievements. What can I say about a game where you add to get a high score while a blue bar slowly drains to end the game. To be honest, there isn’t much to say about such a simple concept. All you have to do is to tap on randomly generated numbers from one to nine so you can add up to the big yellow number. There are things like if you add quick enough you can do combos , a number in a red square which explodes, a question mark that gives a random number, selecting numbers next to each other to form chains, using the same number repeatedly which all contributes to getting a more points. You can increase the time gauge by adding quickly. A game usually lasts about a minute unless you can keep up and add quickly. Addimania’s graphics are simple, colorful, and polished. I don’t think anyone can mess up in this area of the game. I think the graphics might appeal to children more than anyone else. There are some robots with the plus symbol in the game but nothing special. The music is calming although repetitive. I hope Home Cooking would allow iPod music support. The sound effects range from beeps and a buzzer sound that means you went over the amount you are suppose to add up to. There is also a sound that goes off when you added up to the displayed amount. There is no option to turn on or off the music and the sound effects. To me, the audio is mediocre but I think it will be helpful for children who plays this game. Addimania wouldn’t appeal to too many people despite its simple concept. There are three modes to choose from. There is add up to only ten, add up to randomized numbers, and a mode to increase the time which doesn’t really work out or maybe I am just not quick enough. For a game with a name that features add and mania, I thought it would last longer but the amount of time they give you to match and the “increase” from matching quickly is not enough. Maybe if Home Cooking can have a true endless mode, increase the amount of time you can get for doing combos, and add iPod music support, Addimania would be a much better app. Also, I think Home Cooking can change the name to Mathemania or something of that sort which features adding, subtracting, multiplication, and division the game would be more enjoyable. 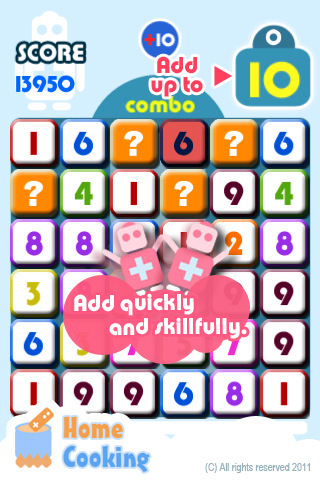 For example players can select the type of math they want to play and match the displayed number that way. Another idea is to select a number on the grid, the math symbol, and another number to get the required amount. I cannot recommend this game to anyone I know but I think this is a good game for children who are learning how to add. AppSafari review of Addimania was written by Tony Lau on March 24th, 2011 and categorized under App Store, Board, Education, Games, Puzzler. Page viewed 5009 times, 1 so far today. Need help on using these apps? Please read the Help Page. A great game for quick minds. Wasn’t difficult to play at all. Add it up! enjoyed my time playing with it. I would definitely recommend it to my friends.